So your keen to start barefoot running, but want to rather use a barefoot running type shoes like the vibram five fingers. 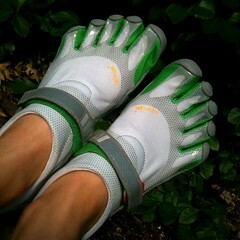 Maybe you have just got yourself a new pair of vibram five fingers and want to know how to get started with using them. I found a cool video from other vibram five fingers runners who gave their hints and tips on how to start running in a pair of these barefoot type running shoes. The users recommend you take it step by step as these vibram five fingers are not like any other shoes you may have experienced before. Check out what else they have to say. Some people say the feel less pain in their joints from learning how to run barefoot in minimalist running shoes. One doctor of Chiropractic who is a key proponent of barefoot running to help the body heal chronic pain is, James Stoxen. James is the chiropractor who helped Anthony Fields from the Wiggles in his book “How I got My Wiggle Back“. I have added the fix barefoot running pain video series by Dr James Stoxen below. He also explains why he believes in barefoot running to improve your body as a spring coil and how to get your feet, ankles and body ready to start running barefoot.